Outside the convention, protesters staged a mock drone attack. When are we, as a nation, going to have a frank discussion about drones and remote-controlled killing? One might think that such a dialogue could take place when thousands of people come together, once a year, at the gathering of the Association of Unmanned Vehicle Systems International (AUVSI). Wrong. But AUVSI, the lobby group for the drone industry, brooked no dissent at its August 6-9 Las Vegas Convention. When I, as author of a new book Drone Warfare: Killing by Remote Control, tried to rent a room at the Convention Center to give a presentation on my book, AUVSI vetoed my request. When I tried to register as a journalist, I was told that I did not meet their criteria, but they refused to say what that criteria was. And after registering online as a normal participant and paying the $200 fee, when I appeared to get my badge I was yanked off the line, surrounded by police, and told I would be arrested if I set foot in the Convention Center during the duration of the gathering. The same thing happened to Father Louie Vitale, an 80-year-old Franciscan priest who had registered and pre-paid for the conference. Father Vitale is known for his dignified, faith-driven stance against war, including drone killing. “There’s something from my Air Force days that fascinates me about drones, which is one of the reasons I wanted to get in to see the exhibits,” said Father Vitale, “but I also wanted to have conversations with some of the drone manufacturers and operators.” That was not to be. Unprovoked, Father Vitale found himself surrounded by Convention Security and Las Vegas police, who threatened him with arrest. A few peace activists did not get immediately stopped by AUVSI’s thuggish security, but two of them were banned when they dared to simply ask a few probing questions to the exhibitors at the booth of General Atomics, the company making the lethal Predator and Reaper drones. “I was merely asking if the company feels any responsibility when its products are used to kill innocent people in places like Pakistan and Yemen,” said Jim Haber of Nevada Desert Experience, a group that has been peacefully protesting nuclear weapons for decades. The Army, Navy, Air Force and Marine Corps had their exhibits. So did weapons manufactures such as General Atomics (maker of the Reaper and Predator drones), Northrop Grumman (maker of the Gray Eagle, known for its “lethal persistence”) and Boeing (maker of the Phantom Eye). Other exhibitors were military bases like Yuma Proving Grounds in Arizona and Edward Air Force Base in California that are trying to rent space out to private companies to test and develop drones, and universities like the University of North Dakota touting their training programs for drone operators. “Some of us are worried about the unregulated proliferation of drones, and the innocent people who are being killed in our remote-controlled wars” said Jim Haber, who lives in Las Vegas and often vigils outside the nearby Creech Air Force Base where drones killing people in Afghanistan are being piloted. “But AUVSI is worried about peace—and people who profess pro-peace views. I suppose they see us as bad for business.” Indeed, some of the sessions addressed the dronemakers’ concern about finding new markets with the wars in Iraq and Afghanistan winding down. 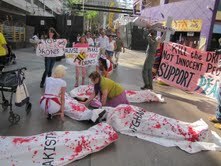 Outside the Convention Center, protesters staged a die-in to commemorate the innocent people killed by lethal drones. And the next morning at 6 am, a handful of peace activists headed out to Creech Air Force Base 40 miles away to greet military personnel driving into the base, some of whom are drone operators. “Peace be with you, brother,” the priests called to the military personnel in their cars. Overhead, a menacing Reaper pierced the desert sky. Twenty minutes later, alerted to the ragtag pro-peace group, several large police SUVs came careening down Route 95 towards the base. AUVSI is not the only group threatened by devout peacemakers. Medea Benjamin, author of Drone Warfare: Killing by Remote Control, is cofounder of CODEPINK and Global Exchange.